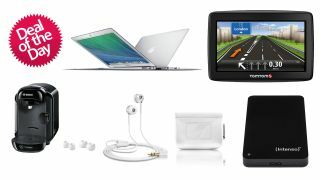 TechRadar Deals: Games, TVs, TomToms, hard drives, headphones + more! Pick up a great deal on tech before Christmas. Pick up a tech deal today! Another day, another set of hot deals on great gadgets and games! Today we've got hot deals on hard drives, headphones, sat navs, laptops, graphics cards, console games and plenty more. Let's start with this supreme deal on a second screen TV at eBay. The LG 22MT44 is a 22-inch full HD 1080p Freeview TV, ideal for a bedroom or a kitchen, and it's currently available for just £99. Ooh and how about this for a good deal for PlayStation gamers? Pick up £50 worth of PlayStation Wallet credit for just £40 at Rakuten - that's free money, yo! Just use the secret code JANOFFER10 at the checkout. We always include portable storage options in our deals pages simply because they're so popular. Check out this 1TB - that's 1000GB - portable USB 3.0 superfast hard drive. Currently available at eBuyer for just £41.99. How about this for a great deal on personal navigation? The TomTom Start 20 - we gave this thing 5 stars a few years ago - is now available for the supercheap price of £69 at Tesco Direct! Sennheiser headphones always go down well on these deal pages, and the super popular Sennheiser CX 300 II is still just £18.99 at Amazon. They're bargainous earphones that punch well above their weight. Looking for a new laptop? There's currently a superb deal on a Macbook Air at Amazon. The Core i5 1.4GHz, 4GB, 128GB SSD version is currently just £620 while stocks last - this deal won't be available for long. Go, go, go. Is it coffee o'clock yet? Of course it is, and you can currently grab this BOSCH Tassimo hot drinks machine for just £35 at Currys!